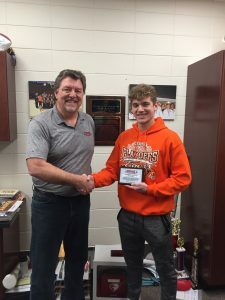 Randy Ruef (left) of SportsfanRadio 1330 presents the Student/Athlete of the Week award to Byron two-sport senior Tyler Camling. 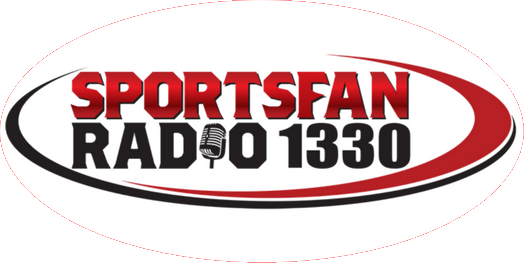 This week’s recipient of the Sportsfan 1330 Student/Athlete of the Week is Byron two-sport senior Tyler Camling. Tyler has just finished a storied football season, in which he and his teammates reached the state championship game. Tyler was among the team’s top rushers and tacklers. And now he has taken his skills to the basketball court. But despite is success as an athlete, he is just as much a success as a person and a student. Tyler is currently taking three AP courses, is a member of the Yearbook Committee and has been on the honor roll every year. Volunteering is also big for Tyler, as he is involved in Byron Fest and served at the Madrigals Dinner. He has also helped with the Maggie and Amos Memorial Benefit Running Games for the kids. This Student/Athlete of the Week is geared to honor athletes who do more than star on the field or court. While they don’t have to be all-conference as an athlete, we want people who are all-conference as students and community members. Tyler certainly represents the intent and spirit of the Student/Athlete of the Week. This award will be given weekly throughout the school year. If you know of an athlete who fits our qualifications, click here to fill out a nomination form. To see our presentation video with Tyler, click here.